UKPLUS Osaka is a small corner of Britain in the heart of Japan’s second biggest city. Our British English language school is like many language schools in the UK. We are a small, friendly school with professionally qualified teachers and knowledgeable staff. We have a comfortable public space where students can relax and chat to friends and the school is located on a quiet street only 3 minutes from Osaka Station and Hankyu Umeda Station. 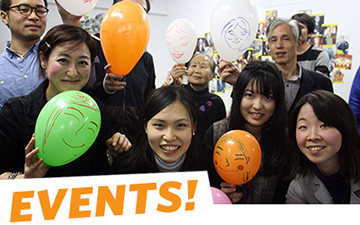 We opened our doors for the first time in 2010 after the closure of the British Council teaching centre in Osaka. Since then we have steadily built a reputation for teaching quality and customer care. 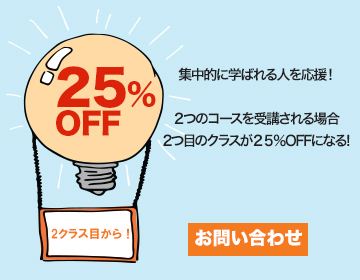 We believe that people learn better by using the language, not only studying it. We believe that people learn from the environment around them. We believe that people learn best in a fun and relaxing atmosphere. So, we believe in developing a strong community of learners all working together to achieve common goals. We also believe in providing opportunities for learners to use English outside of the classroom, so we have an active social programme, which increases the community spirit within the school. 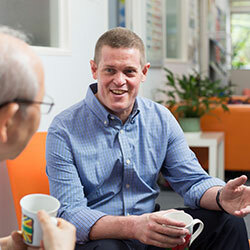 UKPLUS Osaka is a place where life-long friendships can be made. Although most of our customers are Japanese of all ages, from 5 to 85, and all backgrounds, we have also welcomed customers from all over the world – including Russia, Italy, Germany, Ukraine, Nepal, India, Sri Lanka, Pakistan, Korea, Vietnam, Thailand, China, Indonesia and Iraq. On your first visit to the school, you will be met by friendly staff and teachers and you will be asked to take a short written English test and and have a relaxed conversation-style interview with one of our friendly teachers. When you have done this, we will give you advice on which is the best course for you. The whole process takes just over an hour. If you are interested in IELTS it will take about 30 minutes longer as you will need to write an IELTS style essay so that we can give you better feedback. We offer a wide range of courses and our experienced teachers are all skilled in preparing fun but challenging lessons – even our academic writing courses are a lot of fun! We offer group and private lessons in General English, Business and Academic English. 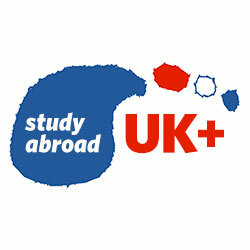 We also offer preparation courses for IELTS and Cambridge Exams. Our group classes tend to have between 4 and 6 students. A lot of customers come to us because of our reputation for IELTS preparation. We offer IELTS group classes and a range of private IELTS options. Over 90% of our IELTS students achieve their IELTS goals. All our teachers are native speakers from Britain and all contracted teachers are Cambridge Delta qualified with many years of experience. UKPLUS works with IH house, London, to offer teachers opportunities for professional development. We are keen to offer teachers in Japan and East Asia the opportunity to develop their teaching skills. We have been a test venue for the Distance Delta Module 1 Exam several times now, and we are the only venue in Japan to have hosted a Distance Delta Module 2 Orientation Course in the last 10 years. We are currently offering another Module 2 Orientation Course in March 2016. We also have regular TKT sessions on Saturday evening and are always looking for more participants. If you are interested in any of the above contact us today!